A dissertation is one of the most complicated and challenging academic assignments. This is not surprising. It gives a doctor’s degree or qualification profession. Consequently, this assignment is really demanding. 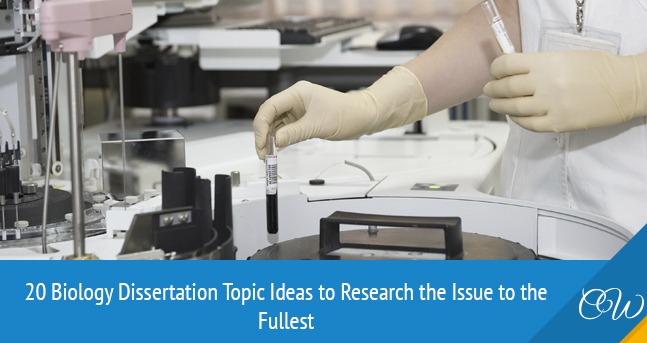 Your first objective is to know all the criteria for your dissertation. A biology dissertation does not differ from any other kind of dissertations. The demands remain the same and you ought to complete them properly. Afterward, you should find out how to fulfill every stage. It’s quite possible that you’ll have to improve your writing quality. Of course, you ought to know the material properly. Biology is a very interesting and likewise difficult discipline. It studies the living world around us. Some subdivisions may be too complex for your understanding. However, if you have a choice of your topic, this may be your chance to escape complications. How Can We Protect Flora and Fauna Species From Extinction? Could Be Ebola Used As a Biological Weapon? Is There Any Link Between Cancer Cases and Environmental Problems? Where Did Human Originate From? Did Life Really Exist on Mars? The Issue of Vaccination: Is It Dangerous for Children? How Does Our DNA Affect Our Lifestyle and Behavior? How Can We Enhance Our Immunity In a Safe Way? What Viruses And Illnesses Can Be Spread by Birds? Which Dangerous Diseases Originate From Misfortunate Scientific Experiments? How Threatening The Extinction of Single Species for the Life in General Is? Is It Really Possible to Stop a Dangerous Development of Global Warming? Why Do Scientists Divide Species Into Subgroups and How Is Classification Carried Out? Take these themes into your consideration. They are all diverse just like all those species in the animal and plant worlds. Some of them will be really close to the heart so that you could write about them with enthusiasm. Use these ideas to create original and relevant topics to find effective solutions as well as present interesting facts. At times, all we need is to see how to compose an assignment with our own eyes. The practice is not the same as the theory. Many theoretical aspects look good only when spoken. They are different when it comes to the writing process. Therefore, you should read some examples to understand how to put the things together. Unfortunately, more and more species of animals and plants are threatened and may potentially disappear. The history of our planet knows multiple grievous cases when we lost the representatives of flora and fauna. What can be done to prevent the extinction? This question should be on the mind of everyone. The humankind should protect animals and plants from extinction, and the first step is to realize the factors that lead to this terrible process. Scholars have grievous predictions. They believe there will take place another extinction of species before the year 2050. This was stated in National Geographic News. The reasons for that are various, and it’ll be triggered naturally and by the human factor. It is well-known that the disappearance of the slightest species may lead to destabilization of the natural processes, and the planet will go through a catastrophe. The negative reflection will be echoed for everyone. Undoubtedly, this process must be stopped at any cost. In order to succeed in this matter, we should understand the possible reasons. One of such is deforestation, which is caused by mass urbanization. People have no place to live in, and they cut the forest. Nevertheless, it leads to a loss of its habitats. Nearly 36 million acres of woods are being cut yearly. This is a huge mistake. Another factor is global warming. The so-called green effect negatively influences temperatures, which induce warming throughout the globe. In turn, this melts down ices and negatively affects plants and animals. Even 1 degree may carry danger. Besides, the amounts of carbon dioxide increase as well. Scholars theorize that the process may lead to the disappearance of 56,000 plant and 3,700 animal representatives. Another great mistake is the introduction of animals and plants that are not native in some regions. Our race wishes to spread them throughout the planet. Nevertheless, they cannot adapt to the new surroundings and pass away. Besides, overexploitation, likewise, makes its deadly contribution. The excess exploitation of definite areas leads the environment to exhaustion, which also kills many animals and plants. This should be done reasonably. All these facts show us that the human race destroys many representatives of flora and fauna. We should recognize and avoid such actions. There is still time to cure the damage done. It’s not possible to stop certain processes as they are needed for the surviving of the humanity. Nonetheless, some alternatives should resolve the issue. Try to remember this sample and craft the similar ones. Of course, one example may be not enough. You are welcome to read other effective samples on the biology themes. This provides you with additional information and helps to compose really meaningful and impressive dissertations. Don’t forget to improve your writing skills. Learn all academic demands concerning dissertation writing and work out every stage with a high level of dedication. Use universal tips to turn your dissertation into the real masterpiece.